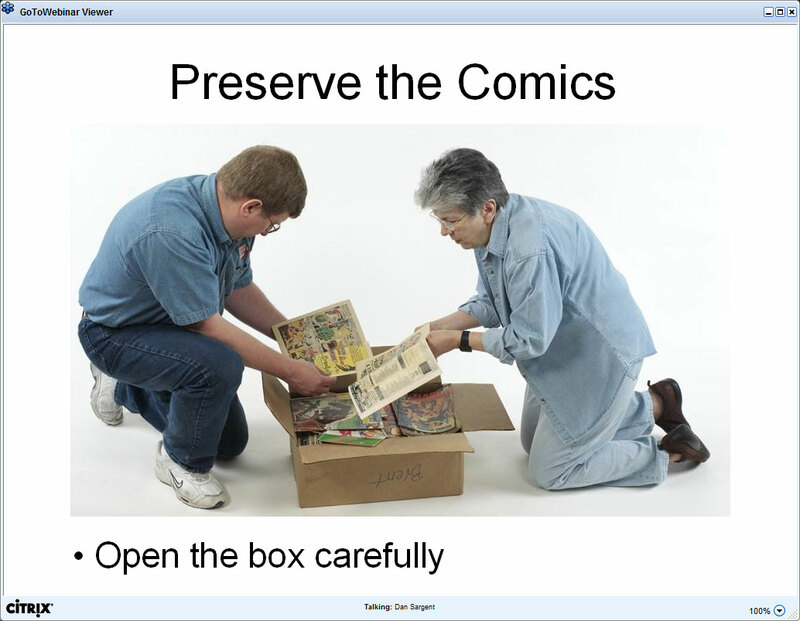 Maggie Thompson and Dan Sargent (both of Comic Buyers' Guide fame) hosted a webinar entitled "Is My Comic Worth $1 Million?" last night. They were playing off the recent "$1 million plus" sales of old Superman and Batman comics, and catering to a resurgent interest in comics as an investment. The event was free and, though scheduled for an hour, ran for 90 minutes. They basically went through all of the basic information on grading and selling comics. The various ratings, slabbing, price guides, defects, storage, etc. Lots of good examples of everything. Probably nothing new if you were a professional retailer, but there were a few things I hadn't heard before. (For example: long boxes are bad. Not for comics, but for your back!) They answered a slew of questions, including doing some "on the spot" valuing of three comics viewers had sent in scans of prior to the webinar. 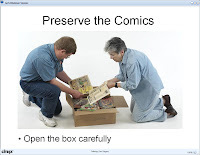 Grading and valuing comics was always tricky for me. I've long understood the basics about condition and scarcity and perceived significance and whatnot, but I've never really been a collector per se. My mentality has always been one of: what is the comic's entertainment, educational or emotional value? I'm willing to pay for the reading experience, and I'm willing to put a monetary value on that, but I don't place any additional value on the object itself. Whether the comic is an original or a reprint or part of a trade paperback collection, I don't really care beyond it's accessibility. I used to put greater value on older comics, and I was willing to (and occasionally did) spend hundreds of dollars on unique issues once upon a time. But that was, in part, because reprints were hard to come by, if they existed at all. Oh, there were whole comics devoted to reprinting classic stories, but they almost inevitably dropped enough in sales that they were canceled. But, here and now in the 21st century, reprint material is flowing out at an astounding rate. It sometimes seems as if everything has been reprinted! So for those of us who are more interested in a book's contents instead of its actual condition, the $1 million comic is effectively a non-issue. I can still read the first appearance of Superman or Batman or the Spectre or just about any other character every created for considerably less than whatever the sale value of an original copy of the first comic they appeared in might sell for. Even so, it was still interesting to see that the market for actual pulped wood comics is still so viable, and they presented plenty of examples showcasing the increasing collectiblity of comics beyond the recent, and somewhat obvious, high sellers. The fundamentals still remain the same, just for a somewhat different group of individuals. All in all, it was a good presentation, especially considering that it was (from what I gathered) their first attempt at conducting a webinar like this. There was a good mix of statistical data and casual recollections. It was friendly and accessible for a wide range of people. I'll be keeping my eye open to see what other topics they might cover in the future. But I'm still not going to pay $100,000 for Captain America #1, regardless of what condition it's in!